Obesity Reasons and how to Avoid and/or Overcome - Something New Everyday! Dietary and life style practices are directly related to obesity. The most important cause is the imbalance between the energy intake and output. Energy is obtained from the food one eats and is required to carry out the daily activities, and the body functions, which are going on even when one is sleeping. The extra energy which is not used by the body is stored as fat. 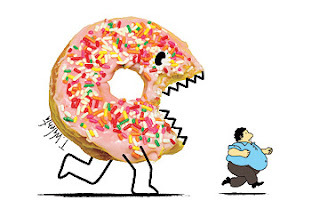 Eating more than one need causes obesity because the excess energy supplied to the body gets converted into fat. On the expenditure side, if a person is physically less active then less energy is utilised and more is converted to fat. Home, work and school are barriers to opportunities for active lifestyle. Children of obese parents are 10 times likely to be obese than those of non-obese parents. This is mostly environmental since the children and parents share the same dietary habits. 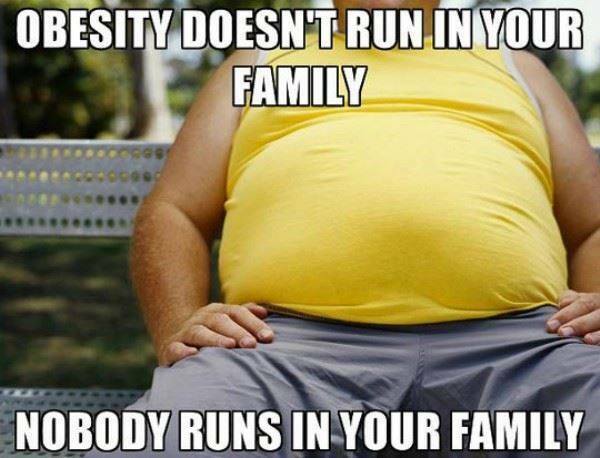 Genes influence how the body burns calories or stores fat. In some rare cases, hormonal imbalance, such as overactivity of the adrenal glands or underactivity of the thyroid gland, can also cause obesity. Injury or inflammation of the hypothalamus can interfere with the appetite centre and thereby cause obesity. The signs of obesity include body fat and weight more than the ideal body weight. Obesity is a serious condition as it increases the risk of heart diseases, diabetes, joint pains, high blood pressure and some types of cancers such as colon, breast and uterine cancers. Obese people are also more prone to diseases and problems such as stroke, gall bladder disease, breathing problems (sleep apnoea syndrome), low back pain, swelling of the feet and ankles, imbalances and accidents. Obese people have a low self-esteem and they avoid company, which makes them insular and insecure. Obesity is determined by measuring body weight and fat. There are different ways of calculating body fat. Body mass index (BMI) is one of the best methods used to measure body fat. BMI is calculated as the ratio of the weight in Kg and height in square metre. Guidelines define overweight as a BMI between 25 and 29.9 kg/square meter and obesity as a BMI greater than 30. The doctor may also suggest blood test for sugar, cholesterol, and triglycerides. In case insufficient thyroid functioning (hypothyroidism) is suspected, the doctor will ask for a thyroid stimulating hormone test. especially the fat content, and increasing physical activity. activity includes walking, jogging, swimming, cycling, aerobics or any other household activity such as cleaning, washing, climbing stairs etc. The sense of well-being and weight loss motivates an individual to make changes in his or her diet as well. The best way of keeping a good control on ones dietary intake is to keep a daily diary, and writing down whatever one eats as one eats. Avoid high oil content in the curries and do not use butter on chappatis, which may be tasty without the fat. The doctor or health care provider evaluates the daily diet and plans a diet providing calories enough to maintain the weight below the ideal body weight. Increase your physical; activity and reduce the intake of food. Your initial goal of weight loss therapy should be to reduce the bodyweight by 10% from baseline. With success, further weight loss can be attempted.Weight loss should be 1-2 kg for 6 months. Reducing dietary fat alone without reducing calories is not sufficient for weight loss. Reducing dietary fat along with dietary carbohydrates can help reduce calories.Weight maintenance program should be priory after 6 months. In order to maintain one's weight, calories consumed should be equal to calories used. Energy balance is like a scale. When calories consumed are more than calories used, it results in weight gain. Let physical activity tip the scale in your favour. You can perform aerobic exercises 30 minutes a day thrice week. Avoid a sedentary lifestyle. Certain medicines are also available for weight reduction. There are two main types of weight reducing drugs: one class decreases appetite while the other prevents dietary fat from being absorbed by the body. These drugs should be taken only with doctor"s advice, as there are a lot of side effects related with their use. Surgery to cure obesity should be undertaken as the last resort for people who are very obese, have tried all the other options available and have medical problems. The main surgical option is to have your stomach banded or stapled so that it cannot accommodate more food. Why not eat less voluntarily? aerobic exercises. Aerobic exercises usually involve vigorous exercises sustained over a period of several minutes and their effect is to increase the efficiency of the lungs, heart and blood circulation,which are collectively known as the aerobic system. Short and sharp bursts of activity which rely on the body"s reserves of oxygen do not produce a similar improvement. Exercises should increase strength and mobility and also aid relaxation. You can choose walking, swimming,bicycling as per your fitness level and increase gradually. You should plan on 20-minute sessions at least 3 times per week. Gradual changes in eating habits will help encourage a permanent lifestyle change. A slow weight loss of 1 or 2 pounds a week, until the desirable body weight is reached, is best.